Burgundy authority Allen Meadows guides the reader on a captivating and richly detailed journey through Vosne-Romanée, the most legendary region in Burgundy historically and aptly called La Perle de la Côte or The Pearl of the Côte. Whether you are a novice or an experienced connoisseur, you will greatly expand your wine knowledge with this 350-page treatise as you learn the rich and fascinating history that contributes so much to what makes these inimitable wines so special. Meadows, known to wine lovers around the world as Burghound, explores the underlying terroir of each of Vosne’s grands and premiers crus, explaining its significance in the vineyards and giving wine lovers the insight necessary to know what they should expect to find when opening one of these masterpieces. Pearl is packed with useful information including the history of each terroir, the top producers, specific grower holdings, and collecting tips. To help put it all in context, Pearl includes original and meticulous modern maps, creative art work, and stunning photography. 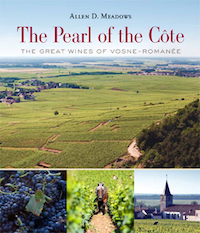 Meadows’ extensive coverage includes a full chapter on each of the Vosne-Romanée grands crus — Echézeaux, Grands Echézeaux, La Grande Rue, Romanée St. Vivant, Richebourg, La Romanée, La Tâche and Romanée-Conti and complete coverage of every one of the Vosne-Romanée premiers crus (Les Beaux Monts, Les Brûlées, Cros Parantoux, Les Gaudichots, Les Malconsorts, Les Suchots and more). There is also a chapter describing what could well be the greatest tasting ever held with 74 vintages of Romanée-Conti, from 1870-present. Here you will find associated tasting notes including Meadows’ first 100-point wine! For those who wish to become an expert on the wines of Vosne-Romanée and Flagey-Echézeaux, there is simply no better way than to pour a glass of your favorite Vosne while enjoying the most complete exposition on the region ever written.